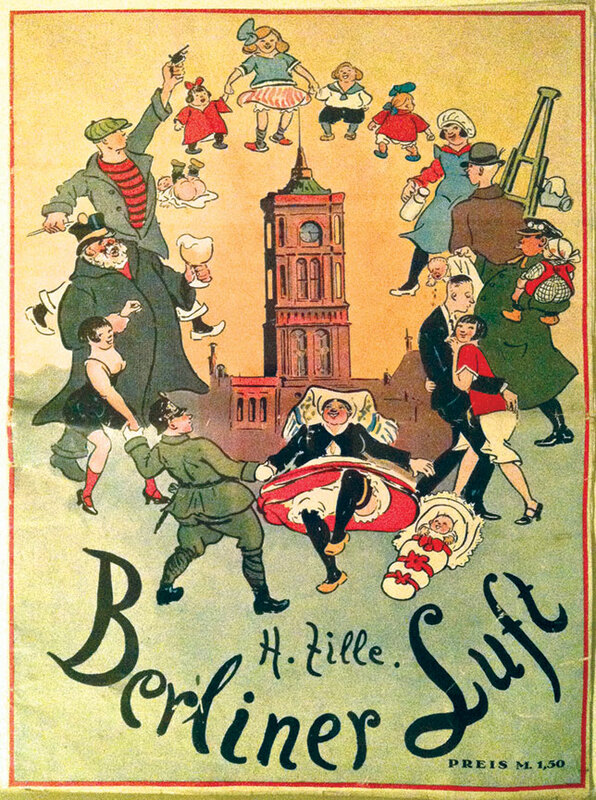 Poster “Berliner Luft” by Heinrich Zille. There is an old saying about how special the air is in Berlin, but I think it’s more about the energizing qualities of this city than the air. I like living in Canada, but I must admit that it feels too Britain-oriented to me at times. Given Canada’s history, that makes sense of course. However, like many Canadians, I am not of English background, so the focus on what’s coming from England sometimes means we miss out on what is going on elsewhere in the world — for example, in Germany. Here in Berlin, I am discovering how friendly a city can be and what a great culture it has to offer, and what lessons might be learned from a city like Berlin. Vancouver, for example, is considered by many people to be quite unfriendly, especially when you’re new. That is definitely not the case in Berlin. I find that people seem “real” here, meaning they don’t mind talking to strangers, they don’t put on airs, they are being themselves and don’t seem to feel they will lose their soul if they speak a few words with someone they’ve never met. It is considered uncool to be a relentless self-promoter, to be chasing after money, to flaunt wealth, or to overcharge for anything. Throughout Berlin, I find prices for events and museums to be quite reasonable. They also always offer reduced rates to people who are seniors, students, unemployed, or in the military or doing volunteer service. Maybe socialist principles (and I believe small-s socialism is a good thing) have grown stronger roots here than in many other places, given Berlin’s history. While this is a major centre of art, culture and history, it does not have much commerce. This means Berlin is still relatively inexpensive to live in, although that is changing rapidly. Unfortunately, it also sounds as though lucrative jobs are not common here, which is already a problem in combination with the rising real estate and rent prices. On Saturday, November 8 it was time to visit another one of my heroes: Heinrich Zille. The Zille Museum is a small museum in Berlin’s Nikolaiviertal (= Nikolai Quarter, centred around the Nikolai Church). Zille was pretty much the original Berlin urban sketcher, capturing with his drawings the life of the poor people of Berlin in the late 19th Century, with their heavy workload and long days in factories, their street smarts, and their sometimes hard-scrabble life. And the street urchins. He constantly recorded his surroundings and wrote down funny snippets he overheard. 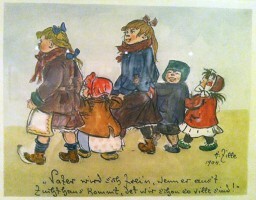 I had books of his cartoons as a child and teenager and always loved his work. After the museum visit, I had time to visit the Weihnachtsmarkt on Alexanderplatz. I looked at the knick knacks (wooden Christmas pyramids, knitted or felted hats, socks, mittens, Christmas ornaments, jewellery, purses, leather goods). I sampled a variety of foods: Glühwein, roasted chestnuts, dried fruit bread, and what seems to be a Berlin pastry called Quarkbällchen — a small round deep-fried piece of dough which seems to have no sugar at all except for the icing sugar that is sprinkled on top. I like it, because it’s small and not very sweet at all. The dried fruit bread was amazing, large chunks of natural-tasting dried fruits and nuts like pear, apple, plums, hazelnuts. Again, that felt healthy. So the only unhealthy item was probably the Glühwein — but that was necessary, because it warmed me up, and because, well, having Glühwein is simply part of the Christmas market experience, unless you’re a teetotaller. 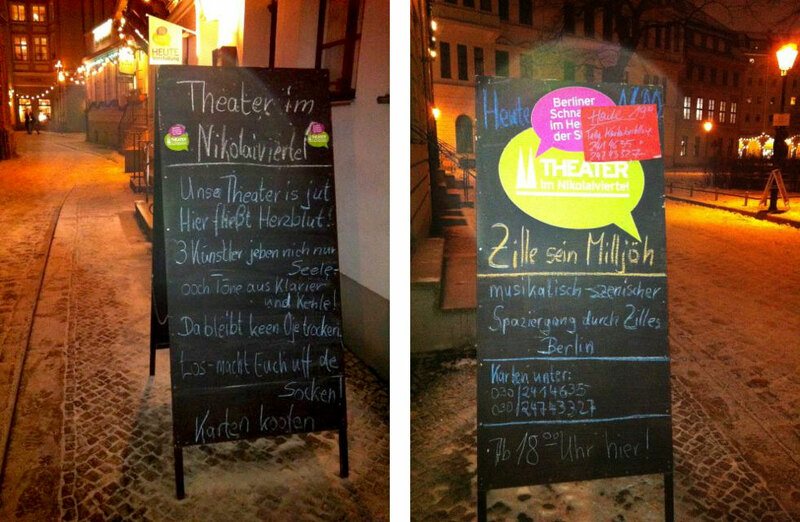 After the Christmas market degustation, I went to a play about Heinrich Zille nearby. It wasn’t really so much a play as it was an interpretation of Zille’s Berlin through songs and skits performed by two actors accompanied by a piano player. The actors, a man and a woman, had outsized personalities to match their physical size, the theatre was a tiny basement room holding about 50 people (I am used to these low-budget venues from Vancouver), and the whole thing was heartfelt, and full of that Berlin vim and vigour. 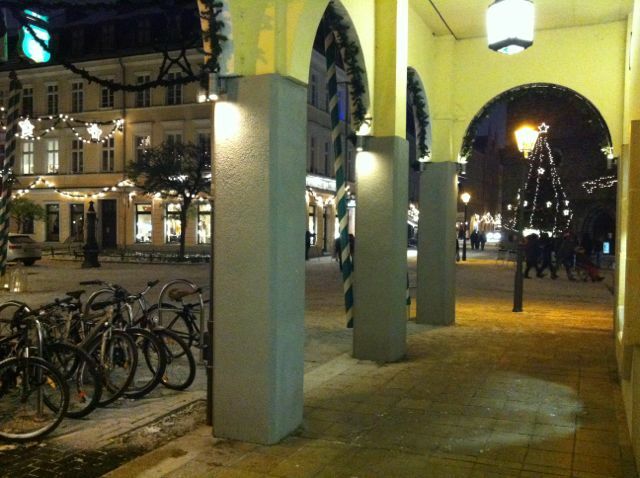 The Nikolaiviertel, where the Zille Museum and the play are located, is the most medieval area of crooked narrow cobble-stone streets that I have yet seen in Berlin. Most avenues are wide and straight here. 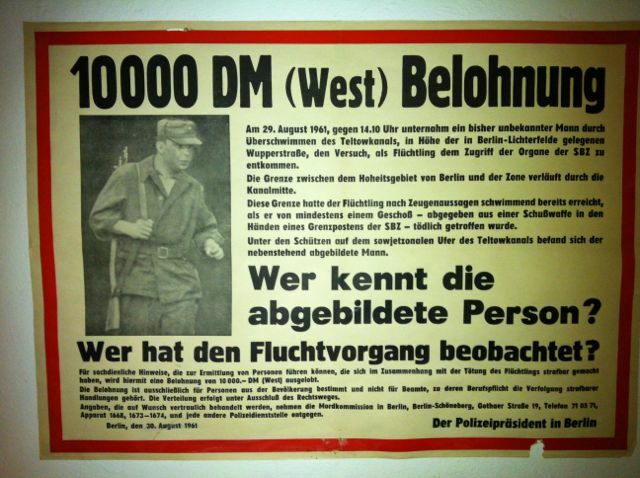 A random poster print from 1961 hung in the theatre lobby, about a 10,000 Deutschmark reward for help in identifying an East German refugee who was shot dead by the East German border police. I often run into these sombre reminders of what life was like in East Berlin 25 years ago. A cute writeup on the sandwich board talks about the passion of the 3 actors who are creating an impressionistic portrait of the illustrator Zille’s Berlin, with not just soul, but also song and dance and their blood, sweat, and tears. And they promise that you will cry, but now you need to rush and buy tickets. ooch Töne aus Klavier und Kehle! Da bleibt keen Oje trocken. Los — macht Euch uff de Socken! 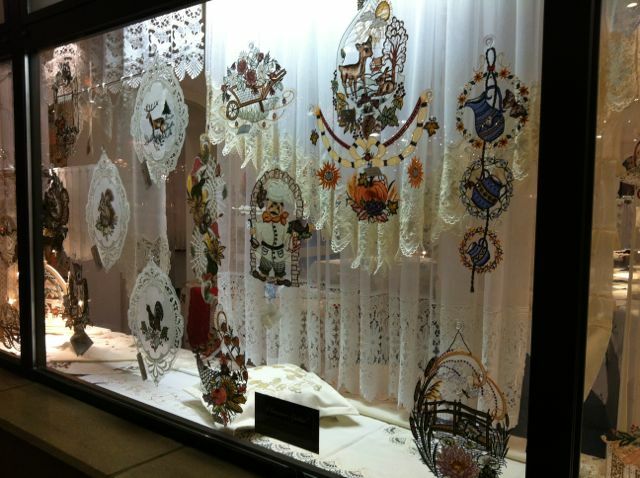 Traditional lace from the former East German area of Plauen. This shop has apparently survived the socialist regime, and it looks a bit “Ossi” to me, I must say. The lace is pretty impressive, but not my taste at all.